In the Catalogue of Imperial Faberge Eggs, between the years of 1885 and 1916, fifty-four Imperial Faberge eggs were commissioned by the Tsars Alexander III and Nicholas II. It all started when Alexander III asked Peter Carl Fabergé (1846-1920) to make an egg for Easter in 1885 as a present for the Tsarina. The rest is Fabergé egg history! The Tsar wished to give his wife, who was born a Danish princess, a very special Easter present to remind her of her Danish home. 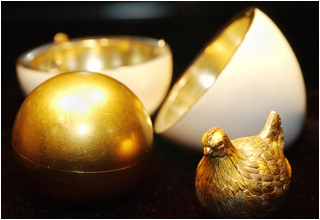 Fabergé's first Imperial easter egg was a copy of a similar egg, made of gold and opaque white enamel and containing a miniature hen, which you can still see today in the Danish royal collection of Rosenborg Castle in Copenhagen. Attracting the eye of Empress Maria Feodorovna with his striking reproductions of Russian archaeological treasures, Carl Fab. was given the title in 1885: Supplier by Special Appointment to the Imperial Court! Not long after his appointment, Faberge created his first Imperial Easter egg for Tsar Alexander III, whose pleasure over the series of bejewelled treasures coincided tragically with the ignominious end to their reign. Purveyor of Imperial Easter eggs for the Russian Royal Family, Faberge is dearly remembered for his Imperial eggs (and other fine objects) that combined hand-enamelling with machine-made guilloche metal backgrounds and set with rose-cut diamonds after the rose-cut diamond was invented in the 1870s. In 1917, the Russian Revolution brought a thunderstorm of violence and ended not only the Romanov dynasty but also brought down the House of Fabergé and the science of jewellery egology. The Bolsheviks seized the Fabergé workshops and their treasures and all production was closed down. Peter Carl Fabergé and his family fled from Russia. However like most good things, their value just keeps increasing over time; the power in oldness! Over the next 30 years, Fabergé produced more than 150,000 objects for the Romanov court, enabling him to employ 500 highly skilled craftsmen and expand his St. Petersburg firm with branches in Moscow, Kiev, Odessa as also London. Forty-seven of the fifty-four Imperial Russian Imperial eggs are known to exist. The unifying theme with most of the eggs is the tantalising 'surprise' hidden inside each one. 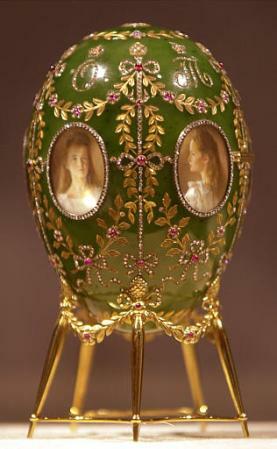 What's Your Favorite Faberge Easter Egg? Fabergé easter egg jewels reveal the impeccable craftsmanship of Peter Carl Fabergé. Each one is a masterpiece of elegance, inventiveness, ingenuity and craftsmanship. 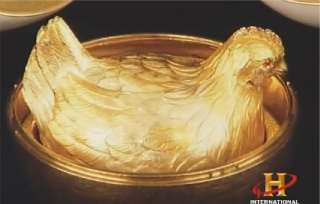 This is why the Fabergé eggs are on the list of the world's most famous collections. A New Fabergé Egg Every Year! The Imperial family loved them! The success of the idea is Fabergé Egg History resulting in an Imperial Commission for a new Fabergé egg every year producing an extraordinary series of fifty-four Imperial presentation Easter Eggs. People of all ages and from all cultures find these Eggs and the history of the Russian Easter eggs amazing along with their Imperial connection. So amazing, that modern copies or fakes are faithfully produced complete with the trappings of fake Imperial provenance in an attempt to deceive an unsuspecting Russian egg buyer. Don't be an egg head! The Full Catalogue of Imperial Faberge Eggs Can Be Found Here..
Solodkoff, A., V. Faberge, Octopus Publishing Group, 1988, London. DailyPress.com - Virginia Museum explores works by Faberge http://www.dailypress.com/entertainment/galleriesandmuseums/dp-fea-faberge-20110706,0,1428058.story at 19th July 2011.